Welcome! You have entered the name of a domain which is currently being held by one of our clients. They have not chosen to connect a website. If you were interested in the purchasing the domain, complete the following form and we will contact the owner to see if there is an interest. If your offer is accepted, additional information including additional contact information will be required. Interested in Buying One of Our Domain Names? This form is used to request information regarding an offer to purchase. Domains which are for sale and have been priced are available using the menu shown in the middle of this page. If you know we own the domain, please provide the domain name in which you have interest. Please enter the price, US dollars $, you are offering. This is the email address we will use to contact you regarding your offer to purchase. Please send future periodic "domains for sale" updates to me. We have other domains for sale. Click on the link below for more information. We may receive compensation from this ad. Looking for other domains for sale? 55 is a great number! It is also known as the “double nickel” so people turning 55 often say they’re “Doing the double nickel!” It is also a reference to the old national speed limit. It is still in effect in some places. Were you born in 1955? Is 55 your favorite number? This domain was created on 11/11/2010. Turning 55, driving 55, truck driver? 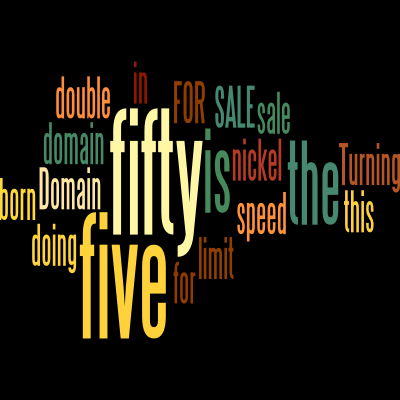 Anything related to 55, hence doing the double nickel, this domain is for you! Interested? Click here for more information. Pricing information will shown when you select “Yes” on the domain page. Do you write resumes and live in a town called Plano? It happens that the original registrar wrote resumes and lived in a town called Plano. Lots of jokes about “Plano” resumes but seriously…..it’s a catchy name for a resume business. This domain was created on 9/15/2009 and is connected to an active website which gives additional credibility. Interested, click here. Pricing information will shown when you select “Yes” on the domain page. Are you looking for a domain for too much of everything? This domain was originally registered on 10/13/2012, just before the 2012 elections. I was listening to a popular talk radio show and the host was discussing having a “glut fest” if incumbent candidate lost. They were going to have a tremendous celebration to over do, over eat, party, enjoy and raise the roof. Unfortunately, the politician was re-elected so it was not a glutfest. Now it’s time for the 2016 elections…will there be another glutfest? I suppose it depends on which side you’re on but it helps to be prepared. If you are planning a celebration or just want to blog about excesses, over doing, over eating or “over” anything else, this is the domain for you! Is your business open and On Point 24 Hours a Day? This domain is a great one for you! 24hoursonpoint.com is a great domain for security related businesses. This domain was created on 6/26/2008. We also hold 24hrsonpoint.com. If are interested in purchasing or making an offer on 24hrsonpoint.com, please click here to visit the sales page. Click here to order or make an offer on 24HoursOnPoint.com. MotherBlesser.com is available for sale! on Afternic. MDKesler.com is for sale. Interested? Form to purchase or receive information about MDKesler.com.com. We would like to send you emails in the future about domains for sale. Check yes to be added to the list, we use a double opt-in system so you will receive a confirmation email. Please confirm your registration by clicking the link. Your domain registrar isn't required to make the transfer but will help insure we are watching for any emails from your registrar related to the transfer. The email address shown above will be used for transfer transactions. Please provide additional information if needed to facilitate this transfer once payment is received. Please enter your offer in US ($000.00) currency. The amount will be shown in the total but not payment information is collected. If your offer is accepted, an invoice will be sent to the email address shown above for payment. Would you like to provide additional informtion about your offer?